Once, when Maimoon ibn Mihraan and ‘Omar ibn ‘Abdul‘aziz were visiting the graveyard, ‘Omar began to cry. Turning to Maimoon, he said: "O Abu Ayyoob, these are the graves of my fathers from Banu Umayyah. When I see their graves now, it seems as if they never participated with the dwellers of the world in their pleasures and lives. Do you not see how they are beset by trials? The insects are feeding off of their bodies?" Omar then began to weep until he fainted. When he regained consciousness, he said: "Let us go, for by Allah, I do not know of anyone who is more blessed than he who comes to these graves, yet is saved from the punishment of Allah." The prophet (may the Peace and Blessings of Allah be upon him) said "Visit it (i.e. 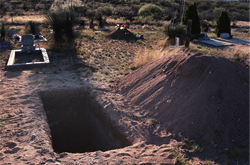 the graves) for indeed it reminds you of the hereafter." [At-Tirmidhee No# 1054]. And from this story we can see how a visit to the graveyard had a profound effect on the caliph and Maimoon ibn Mihraan (may Allah have mercy on them).